Pirates are among our favorite historical figures with their take-no-prisoners attitude and their love of sailing on the open seas. But how did iconic pirate symbols like the hook and the skull and crossbones emblem become associated with pirates? How historically accurate are the items with which we associate pirates and their plunder today? The pirate hook is the classic pirate accessory. 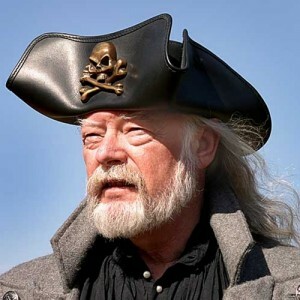 Eye patches and trifold hats have been used by other recognizable groups throughout history, but the hook prosthesis is uniquely associated with pirates. Was the practice of replacing a severed hand with a hook common among pirates? Pirates often were injured in their battles on the high seas. The use of peg legs (another stereotypical pirate accessory) and hooks has been known throughout history, but onboard a pirate ship, no doctor was able to properly fit the prosthetic appendages into place. Therefore, the duty fell to the ship’s cook to perform the operation of attaching hooks, pegs, or any other suitable item on the ship into the wound. Although the practice seems to have roots in real-life events, it could not have been very common. The skull and crossbones, the pirate’s “corporate branding,” as seen on our skull and crossbones cap, is another symbol of pirate life. The skull and crossbones decorated gravestones throughout the 1700s and 1800s, and became synonymous with death. Some pirate captains did fly this imposing design, but others used simple black and red flags. The French rendering for the words ‘pretty red,’ is ‘jolie rouge’, which is likely the origin of the term Jolly Roger. So the pirate hook and skull and crossbones really do have a place in history, though their meanings have been embellished and exaggerated as time goes on. Whatever their true stories, if you’re preparing a pirate costume, ye shouldn’t be caught without either!